By applying extending holding times at distribution hubs, the report has adjusted for additional space in the overall cold store capacity needs. This holding space will get vacated more frequently as operations will advance so as to streamline the supply with demand, to optimise and achieve better space utilisation. Any underestimation will first show up in transport connectivity which should be a focus area for processed frozen foods. 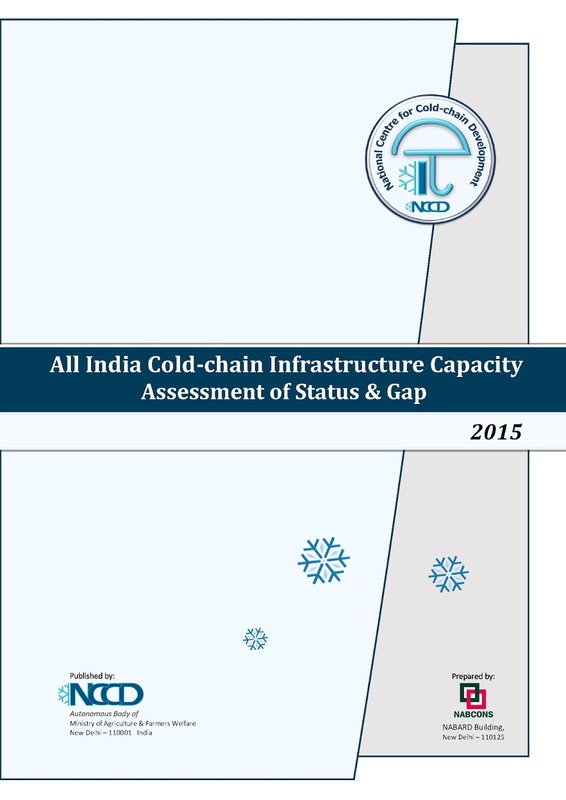 Importantly, the report puts forth the key missing links in integrated cold-chain development, the least of which is the cold storage capacity. The debate today is about how cold stores can be better used as platforms in the integrated food supply chain. Reviewers should ruminate why there is little trade of domestic harvest through the existing cold-chain despite a large footprint in cold storage space. Q2 - The AICIC study has not catered for milk distribution in the cold-chain. This matter of fact is clearly explained in the report. The milk collection and distribution phase is designed around handling a fluid cargo. Refrigeration as a technology is applied when chilling or processing the milk at the collection and processing units. The bulk milk distribution chain uses insulated tankers (non-refrigerated units). In case of processed packaged milk, if aseptically packaged, refrigeration is no longer required. Tetra packaged milk can last without recourse to cooling for up to 5 to 6 months. Once opened at consumer end, it is stored in domestic refrigerators for consumption. In case of non-aseptic packaging (poly-packed milk), reefer movement is used, with very little time spent to cross dock at cold stores, as the foremost aim is to hold at cold cabinets or shelves for access to consumers. The AICIC report contains evaluations for milk by-products such as Ice cream, butter, ghee, etc. though here too retail cabinets play important role to hold inventory at last mile. Despite the high perishability of the fluid, the success of the milk supply chain is well reported and is India is known for having established a highly dynamic delivery system with daily or twice a day turnover. Keeping aside the use of refrigeration for chillers and plate freezers at processing units, the milk chain is uniquely designed for fast movement and derives logistical benefits from insulated transport, reefer transport, retail end cold cabinets and domestic fridges. With the advancement of packaging technologies, the milk in packaged form has reduced the need for cold-chain. Even if all of the 140 million tons of milk produced per annum, was to use the cold-chain to market, the daily throughput would require about 380 thousand tons in distribution capacity, most of it in form of transport, and dispensing units or shelf capacity. Milk supply is currently focused on increasing production and in the optimising of the manufacturing and distribution costs. Horticulture distribution chain could adapt a lot from milk operations for expanding their reach to more markets instead of storing to bide time. Q3 - The AICIC study does not capture the full basket of horticulture produce. Neither were all kinds of processed foods considered. 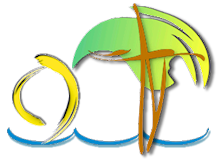 Information on large number of crop types and their current demand was assessed. It would have been unrealistic to evaluate the infrastructure needs for horticulture produce or processed items that do not require cold-chain, or with localised or negligible consumption. Annexe XV lists additional horticulture crops factored to evaluate the infrastructure requirements. In case of long term holding crops, a total of 6 crops types, those that can safely be stored for longer than 4 months at farm-gate, were studied. In case of processed foods, consumption of confections, ice cream, butter, ghee, peas, various meats, etc. were considered. The infrastructure requirements factors the demand by further categorising it into temperature segments, applying a basis of holding life and final throughput to consumer, into the overall need assessment. Information on large number of crop types and their current demand was assessed. It would have been unrealistic to evaluate the infrastructure needs for horticulture produce or processed items that do not require cold-chain, or with localised or negligible consumption. Annexe XV lists additional horticulture crops factored to evaluate the infrastructure requirements. In case of long term holding crops, a total of 6 crops types, those that can safely be stored for longer than 4 months at farm-gate, were studied. In case of processed foods, consumption of confections, ice cream, butter, ghee, peas, various meats, etc. were considered. The infrastructure requirements factors the demand by further categorising it into temperature segments, applying a basis of holding life and final throughput to consumer, into the overall need assessment. It is also relevant to mention that most of the processed foods, when dispatched within the cold-chain, are already on basis of established market demand and availability of last mile merchandising space. The aim of the product owner is to be on the shelf, far in advance of its expiry or use-by date and lack of retail space is critical to such throughput. After all ice cream or frozen peas in a cold store is wasted unless retail freezer cabinets at last mile are available. Time spent in a cold storage is anathema to such movement. The production (by food processor) is closely linked to market demand (on sales forecasts) as far as practicable. Where not possible, the product is stored in captive cold stores under direct control of processor, or on factory premises until a market pull generates directed dispatch through cold-chain. This is typical of all branded food products, where the chain of custody en-route to market is predetermined. Items like dried flakes, jams, pickled, salted, canned, etc. do not use cold-chain. This is unlike in case of fresh produce, wherein the farmer harvests and pushes the produce to nearby available markets (mandis) – the perishable produce arrives at the wholesale end and is pushed to retailers. Most fresh produce can tolerate last mile merchandising in non-refrigerated retail units. Horticulture produce like bers, cardamom, turmeric, etc. can do without cold-chain. Typically, a short buffer in the flow-to-market of either produce or product is maintained in front end cold stores - either at distribution hubs or retail-end cold rooms. The common infrastructure is mainly in form of reefer transport and cooled distribution hubs. The logistics infrastructure needs are synergistic for both fresh & processed supply chain systems and accordingly assessed. Q4 - The AICIC report does not provide for future potential from cold-chain infrastructure. The primary aim of the AICIC study was to report a realistic picture of the current state of affairs on the basis of existing volumetric consumption of food items – on the existing status & gaps. The gap assessment clearly shows the immediate potential arising from the need to develop the reported missing links. The AICIC study did undertake a simplistic projection on the basis of population growth and trends in production, so as to forecast the futuristic requirement for cold-chain infrastructure in the coming 5 years. However, opinion is expressed, that cold-chain itself can impact the consumption habits and lead to drastic changes in farm level productivity. The AICIC report states that the Cold-chain itself is known to have a multiplier effect, affecting consumption demographics, changing demand patterns and upsetting all forecasts. Counterintuitively, certain advancements in food processing technologies, may altogether do away with any need for cold-chain. Refrigeration could then be seen to from the agri-logistics space. However, that may be wishful thinking for the while. Today there is no other recourse, other than cold-chain, to safely serve the agri-logistics needs of perishable foods, especially the fresh food segment. India is the largest concentration of vegetarians, has no option but cold-chain, if its citizens want regular and constant supply of fresh fruits and vegetables in the future. Q5 - There is large production of +6 million tons in meat including poultry, and +9 million tons of fish production. This indicates a requirement of 15 million tons in cold storage capacity and not mentioned in the AICIC report. The volume generated for handling is not one time, as meat harvest is staggered across the year, normally on a daily basis. Of the harvested amount, a percentage is consumed locally. A certain amount is processed or blast frozen at food processing factories. If not being pickled, canned, salted or undergoing other preservation through additives, this quantity will thereafter require cold-chain intervention. 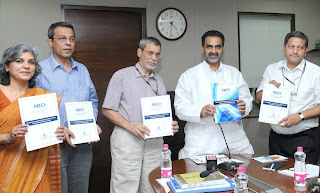 The regional quantum of meat products consumed was assessed through the per capita meat consumption data from NSSO household surveys. The AICIC assessment is on the basis of information of all kinds of meat consumption (not differentiated between canned, pickled of fresh frozen). This entire demand is considered to be held at frozen cold stores at last mile for 15 days, to consider variations or omissions in information. In reality meats would normally be stored for lesser periods in the cold-chain. Similar logic is applied to horticulture production, otherwise cold storage capacity for the full basket of 281 million tons of the annual horticulture production would have been required. In the future, depending on demand, as more abattoirs or poultry factories are setup, the cold-chain requirements could vary from the current assessment. But how will this capacity manifest – firstly at production end in food processing units in form of blast freezers with associated captive deep frozen cold stores. This equipment at production stage, along with slicers, cutters, grinders, effluent treatment, laboratories, etc. form captive part of an industrial facility, and as reported in the study, categorised under aegis of Food Processing Industries. The onwards market connectivity is in form of logistics capacity, which comes into use after the product is dispatched or released from the factory. This capacity is will be in form of long haul reefer transport (rail, road, sea, air), receiving hubs (to deconsolidate for onwards dispatch), reefer distribution (small units for retail-end delivery), merchandising platforms (retailing cabinets) and domestic refrigerators. These components of the cold-chain delivery mechanism have been discussed in the AICIC report. It is a misnomer that the evaluation is a simple mathematical calculation between total produced quantity and space. Cold-chain is about matching throughput with time, distance, market and demand. Q6 - The AICIC has not listed future potential for developing of IQF lines, blast freezers, cold stores which are needed in food processing factories. The AICIC study was tasked to evaluate cold-chain infrastructure requirements and did not extend to future potential of food processing technologies. Cold-chain largely refers to the scientific handling of a finished product or harvested value once entrusted for delivery to market, whereas the production or creation of value (farming or food processing) is a backend activity, prior to market-linked logistics. The study explains cold-chain as a logistics intervention and evaluated requirements in regards to the current consumption of food products, including those produced at food processing units. It should be understood, that all technological equipment used at production end, neither on a farm or within a factory, was considered as part of cold-chain even if it applies refrigeration. The IQF lines, seed stores, dicers, cutters, trucks, tractors, planters, harvesters, irrigation pumps, etc. which are used to create a food product are not strictly under purview of cold-chain, which is a distribution based logistics activity. The application of refrigeration as a technology, does not automatically include the equipment in the cold-chain. A refrigerated cold store holding seeds is therefore not covered under this study. Equally for IQF freezing lines, as these are captive to the input and the process of creating a food product, one that is yet to be readied through a transformative process, for subsequent distribution to market. Until a product or produce is handed over for onwards logistics activity, the allied equipment is under control of the production phase. In India, IQF Lines & Blast freezers are categorised under food processing activity since a transformative process is applied, where the natural characteristics of the agricultural produce being handled is changed. The tax laws accordingly reflect this. On the other hand, fresh produce is ready for logistics handling after harvest. A pack-house merely aggregates this fresh whole harvest, segregates it for market movement, cleans & packs it for safe handling, precools the package for better holding and to transport the produce. 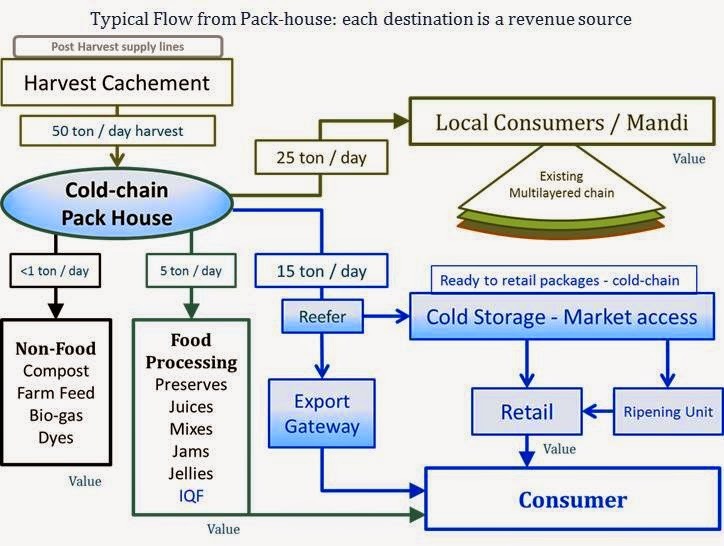 As these activities do not alter the natural characteristics of the fresh food item or transform it into a new food product, the pack-house is considered part of the logistics chain or cold-chain. Accordingly, the service tax is exempted for such pre-conditioning of agricultural produce. While trains, planes, ships, trucks or tractors can form part of the cold-chain, they would at the time be involved in serving as a conduit to market for such goods. Similarly, small insulated carriers, street vending carts, display cabinets controlling temperature and/or humidity, front-end wholesale or retail storage could also form part of the cold-chain distribution network. The study was time and resource constrained and focused on the larger infrastructure components in the cold-chain. The purpose of the study was to provide insightful information on the major gaps which if rolled in could readily service the current and real demand for food. Q7 - The report published by NSEL in December 2010 had projected the need for 61 million tons in cold-chain. The AICIC study indicates a far reduced capacity requirement. The National Spot Exchange Limited, is an organisation well known for its expertise in spot exchange of commodities and collateral management. Firstly, their report was not on cold-chain but on cold storage capacity only. The NSEL study worked out the capacity requirement on basis of peak season production and the highest arrival/ harvesting of fruits & vegetables to markets. It did not incorporate domain inputs on the storability of the crops, the allied infrastructure components that lead to and from a cold store, or other concepts inherent to cold-chain. The NSEL report was modelled on the premise that all the produce could be stored to take advantage of price arbitrage from deferring the commodity for a transaction at a later date. The study did not consider the holding life of fresh produce or any other food products. The conclusions by NSEL are not substantiated by the AICIC study. The AICIC study followed a different approach by linking the current consumption of food products, making the cold-chain evaluation market-linked as well as production linked. Attention is also drawn to the differentiation between size and capacity, holding life and shelf life, and definitions of the various infrastructure components that make the integrated cold-chain. It is to note that the infrastructure needs assessed in the AICIC translates into a total capacity to handle 240 million tons of perishable food items every year. This includes fresh and processed foods, as well meats and milk by-products. Cold-chain is not to be viewed from the narrow prism of refrigerated warehousing, as it includes the pickup or pre-conditioning activities, a transport function, the inventory holding at cold storage, last mile distribution and the retailing and the managing of the waste generated at each stage. Refrigeration may or may not play a major role in any of these activities or functions. Q8 - How realistic is this report? Is it overly ambitious or futuristic in its assessments? The AICIC study is essentially a review of secondary information collated from various implementation agencies supporting cold-chain development. The conclusions derived depend on the accuracy of the information, the differentiation in capacities of existing assets, the disaggregation possible of production and location, and the domain expertise of those that interpreted the data. However, this is the first ever study to take an inverse approach to interpreting the demand for infrastructure using long standing NSSO household surveys of food consumed and lays a realistic direction to cold-chain development. NSSO data is considered par excellence and the trend over a decade were studied. Regional and cultural preferences were also factored in demand for food items. The study reports a mathematical matrix, grounded in realistic information and is neither underestimating the needs, nor projecting any ambitious potential. Importantly, the AICIC report highlights how cold-chain can intervene in today’s flow-to-market of perishables. The results of the study highlight major gaps in form of various missing infrastructure. Fulfilling the gaps in pack-houses & reefer transport units will require highly ambitious efforts of all the stakeholders. Second guessing any future potential would have been misplaced in light of the highlighted missing links, as assessed for the current demand. 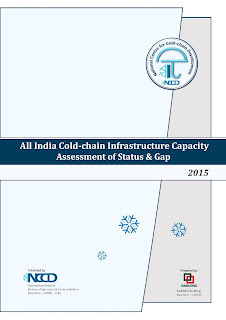 Q9 - When totalling up the State-wise assessments, there is mismatch in the distribution of cold storage capacity and the overall national level requirements. The cold store (bulk) capacity was derived from district level production data, for the crops that can be stored safely at farm-gate for long durations. Yet, the actual location of such cold stores is only indicative to a crop producing region. A facility located a few kilometres away across a state border would still service the storage needs in the overall region. The cachement of a cold storage is not necessarily limited. For example, produce from Bihar may get storage space in UP or Odisha. Market restrictions of W. Bengal can result in the potato from the state moving out in advance to storage space elsewhere. In addition, lack of basic infrastructure in a state, for example electricity or road connectivity, can also cause disparity in development of cold-chain infrastructure. A favourable electricity tariff by some states also affects choice of development. This is evidenced in higher ratio of pack-houses in Gujarat and Maharashtra, as also in the case of cold stores. Yet, as these restrictions do not directly impact farming activity, the harvest is easily shifted to the cold store capacity available in other states. A recent baseline survey by NHB also reports 75% capacity utilisation, year-on-year, indicating most existing cold stores are well utilised. The incidental excess capacity existing in a particular state, therefore does not necessarily translate into a surplus of storage space. However, the same cannot be said of ripening chambers and pack-houses, which have a locational restriction in the supply chain. Mobile assets, reefer transport requirement was not listed statewise, except with mention that they should optimally be attached to pack-houses. A direct arithmetic inference from the statewise breakup of figures may therefore be in disconnect from various domain specific correlations. Q10 - What are the debatable conclusions in the AICIC Study? The study did a primary review of demand from major cities and extrapolated the demand to other high population urban centres. As such the conclusions are limited in regards to demand from 414 million domestic consumers. This could change as more of India’s 1.25 billion citizens also generate demand for goods in the cold-chain. However, this could be met from cold-chain hubs at nearby cities initially. With the advent of GST, the general trend presumed for all goods is expected to lead development on lines of large centric hubs feeding cross regional retail. The AICIC study considered no intervention in the delivery of produce to urban centres within a 24 hour span of harvest (approx. 300 kms range). This may change in the future due to qualitative changes in market demand for certain food types. The requirement of pack-houses had initially seemed too high. An earlier assessment on this component by NCCD had evaluated that about 33,000 pack-house units were required (about 1 every 20 farming villages). However, repeated review of the information has borne out the need for 70,000 base units. The actual number could vary as adjoining modular capacities would be created. Furthermore, changing cropping patterns, improved organisation of farming in the north-eastern states, improving of the base infrastructure, and increased intercropping practices may result in relocation or dynamic variations to the assessments for pack-houses, as made in the AICIC. The report did not exemplify that small cottage industry sized food processing units would adjoin the pack-houses (as these are and added option for gainful recovery of the energy and resources that go into production). The culled quality from pack-houses would feed such units adding more production at farm-gate. The products from such units may add to cold-chain transport and distribution hubs as assessed. Similarly, more rapid development of food processing industries can impact on such future needs. The data on relevant fruit consumption limited the assessment and safely ripened fruits as a health factor could show phenomenal growth in demand in the future. The need and number of modern ripening units may well fall short. The assessment of refrigerated transport units was for a fixed unit size. In actual reality, micro factors will impact the size and carrying capacity of transport units and the numbers can drastically vary. More so, when rail or inland waterways develop cold-chain capabilities, the format of transport units can also be expected to change. The report did not fully assess other last mile infrastructure components, for distribution & retail, due to a paucity of information to deliberate on all the micro-factors. Q11 - In conclusion the AICIC recommends a National Policy on cold-chain. Is it necessary? Farming or food processing, are on the production side of affairs, and can be a State subject. Cold-chain primarily is cross regional intervention, bridging farmland with markets, both domestic and international. Cold-chain has to be driven by a National agenda, preferably on the concurrent list as it is key to a nationwide network for high value foods and for food security. Cold-chain forms the bridge that stitches together the rural landscape with urban consumption, leading to value all around. Its development requires strategic direction which should be implemented under mission mode. The impact cold-chain is not just wealth creation through expanding reach of food to markets, but also on stemming of price fluctuations from episodic availability of foods. Further, the ensuing organisation will drastically reduce food loss to a large extent and help to position us more favourably on the food security map. Cold-chain provides for regular, healthy and safe access to food and cold-chain is key to the future well being of the country. A National Policy on Cold-chain will greatly aid in setting the direction for developing integrated, end-to-end, cross regional, future ready agri-logistics for India.